$19.95 Ages 12+, $12.95 Ages 3-11, Ages 2 and under are free. There is a spot in Davie, Florida, part of Broward County, that is a beautiful, colorful, great place for families to visit. The Flamingo Gardens is a botanical garden featuring over 3000 species of rare, exotic, tropical, subtropical, and native plants and trees. 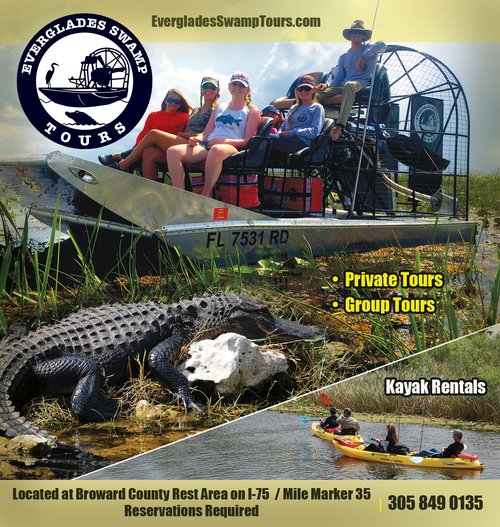 There is also an Everglades wildlife sanctuary that houses Florida's largest collection of native animals including alligators, bobcats, eagles, panthers, peacock, otters and flamingos. Flamingo Gardens history goes all the way back to 1927, making it one of the oldest botanical gardens and family attractions in South Florida. The gardens hold several special gardens, including a butterfly and hummingbird garden, Bromeliad garden, and a Croton garden to give a nice variety for all. The animal sanctuary is pleasantly nestled throughout the grounds, and most of the animals are permanently rescued animals by this non-profit business. There is a half-acre free flight aviary which has over 45 species of wading birds while the birds of pray center in known as one of the largest raptor collections in the United States. Making sure there is enough to enjoy for everyone, Flamingo Gardens offers a wildlife encounters show featuring alligators and predatory birds. There is also a narrated tram tour, which carries families around the grounds. While you're visiting the Flamingo Gardens, you can stop at the tropical marketplace where you can find fruit-smoothies, old-fashioned candies and sodas, homemade sandwiches, jams and pies. Right in the heart of the gardens, next to the Flamingo Pond, is the Flamingo Cafe'. Open all day, the cafe' has freshly made deli sandwiches, hot dogs, snacks, chili and other fine assortments to quench a variety of appetites. The Gardens, like most South Florida attractions, also offer several packages to meet everyone's budgets. Daily rate discounts for seniors as well as children under two being free. On top of that, they do have group discounts and special memberships which allow future visits to be free. Our favorite time for families is to go on Mother's Day or Father's Day when Flamingo Gardens usually allows moms or dads in free (this includes grandmas & grandpas). The gardens are closed Christmas & New Year's Day. This is a quaint, beautiful, and special place to visit, and it will not disappoint. First Friday Food Trucks is back at Flamingo Gardens in Davie with some of the best food trucks in the area for your dining pleasure! DJ Anarchy spins the tunes in the parking lot from 5-9pm.